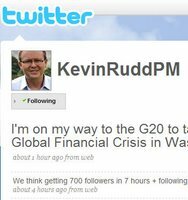 The Prime Minister of Australia (Kevin Rudd) now has a Twitter account. If it’s really him writing in it then it’s brilliant, savvy marketing. If it’s not him, then it’s the worst marketing in the world. On reflection, it has to be him. He can’t lie about it being him doing the writing. It’s almost gimme marketing for politicians – another way to connect.